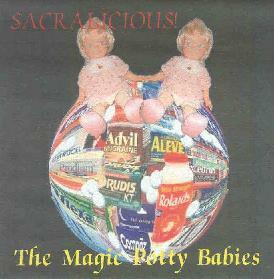 The Magic Potty Babies - "Sacralicious!" Remember the graphic electro-shock therapy scene in One Flew Over The Cuckoo's Nest? Well that's my in-a-nutshell description of the totally mindfucked space freakout that The Magic Potty Babies serve up on Sacralicious! Cosmic but crazy... meditational but chaotic... it's all here. The band consists of Josh Duringer on drums, samples, keyboards, and flute, Mike Adams on guitar and keyboards, Charles Goff III on mini-moog, guitar, vocals and tapes, and Dave Haney on bass, clarinet, and flute. The fun starts with "NO! (Power Of The Word)", a combination of trippy space sounds and electro-rap. Mucho freaky! But it soon tranforms into a pure floating space voyage that becomes the second track, "Klenzer". Beautifully cosmic and meditative electronic space with cool atmospheric guitars. But just as you're really starting to feel relaxed, a female voice sample starts talking about a women whose son's stool sample had worms in it. But we've barely begun, and this must be our cue that things are going to start getting very strange, because with "God Told Me, we're still firmly in space, but it's a surreal and twisted corner of the heavens. Voice samples go from traditional Japanese style singing to an aggressive rant in German. "Beef, Liver, Heart" is a spaced tune that also rocks out. The vocals scream about beef, livers, and heart, but the music has a nice rockin' beat, though it also has quieter tripped out experimental moments, and lots of little freaky bits scattered about to keep things fun. On "The Fishhhook Story", a ranting voice tells the story against prog rocky, avant-space music that is continually shifting gears and revealing carefully crafted mixing and multiple layers of sounds and mayhem. "PVC" is another electronic space track, this one being dark to the point of frightening. It's highly thematic, conjuring up all kinds of eerie images and would be perfect sci fi flick soundtrack music. "In Dependents" features electronic dancey space music with cool beats, and a voice sample over it going on about dealing with a bowel movement in your drawers (should you find yourself in that situation). "Hemogoblin (911 Radio Edit)" and "Blameless Bob And The Wiener Medley" are my favorite tracks on the disc. The former is a heavy driving rocker with crazed voice samples and mindfuck guitar and electronic mixes. It's got a pulsating throb that will rumble in the pit of your chest, and the swirling synths and guitars won't let you sit still for a moment. And Blameless Bob is a 7-minute symphony of complete space madness and mayhem, employing electronics, loops, and studio wizardry to masterful effect. Really mind-boggling. In summary, this is one hell of cool album and is a last minute entry in my best of 2001 list. It's total space, and totally freaky, with lots of experimental detours, but not such that the music isn't accessible. My descriptions may sound a little all over the place, but the tracks segue seamlessly from one to the next, and rather than it coming across as incoherent, I took the abrupt changes to be all part of the fun. It's weird, it's freaky, but all very well crafted. Like Vas Deferens Organization or The Residents as a purely space band. You want something cosmic but different? Check this out. For more information you can visit the Taped Rug Productions web site at: http://www.geocities.com/padukem/. Sacralicious! is distributed by Yippie Bean. You can visit their web site at: http://forsaken.warehouse.net/yippiebean/. Hear loads of songs at the Magic Potty Babies Mp3.com web site at: http://artists.mp3s.com/artists/231/magic_potty_babies.html.